many women get pains around the time of ovulation, in their side or groin. breast fullness or even tenderness is common after ovulation, sometimes intermittent, sometimes lasting solidly till the start of the period. pre menstrual tension, or PMS - pre-menstrual syndrome - is a nuisance side effect of the cycle for many women. Many who suffer have benefited from changes in diet. More information may be obtained from www.pms.org.uk. Some women have incredibly regular cycles, no matter what stresses occur in their lives. For others, exams, a driving test, or an interview at the end of the month can lengthen a cycle by two weeks! 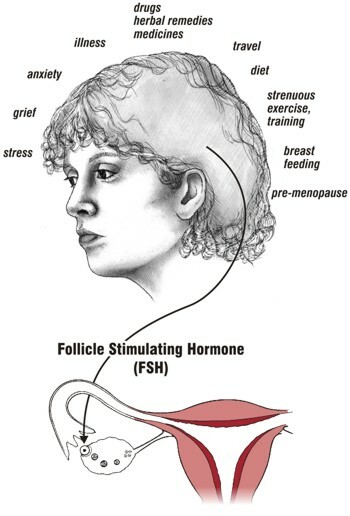 This illustration shows some of the more common situations that can interfere with the hormone signals, usually causing the cycle to run late. Stress and anxiety are the most common causes of cycle disturbance. Bereavements, illness in the family or in the woman herself can also play a part. A variety of drugs, medicines, herbal remedies can interfere with the normal pattern of hormone activity, resulting in cycle changes. Air travel causes many cycles to run late, as does poor diet, excessive exercise and weight training. When the training is extreme, the cycles can stop completely as seen in competing athletes. Breastfeeding and the premenopause phase involve specific hormone changes which inevitably affect a woman’s cycles. Once a woman knows her symptoms, she can recognise these unusual events and their effects on her cycle without any sense of alarm or concern. If you want to learn to chart your cycle, please go to the tutorial 'How to Chart Cycles'.